The Brother’s Grimm fairy tale ‘Rapunzel’ has been re-versioned countless times. In balletLORENT’s version, concluding its London performances at Sadler’s Wells today, Poet Laureate Carol Ann Duffy spins a darker, more emotional thread through the story, tying in the parents and their need to have children. With this comes yearning and desire; feelings perhaps too mature for the younger audience to understand, but nonetheless, are portrayed in this passionate and poignant production coined as ‘family friendly’ with an age guidance of seven plus. Beginning with a richly coloured dance sequence (reminiscent of Danny Boyle’s Olympic Opening Ceremony segment), children laugh and frolic, playing with ribbons and deep red balloons. Segueing to a simpler set involving wire-framed houses, a nearby married couple look on with adoration. But when beautiful stalks of rampion from an evil enchantress’s garden tempt the eye of the wife, the problems begin. The dutiful husband, desperately wanting to please his wife whose inability to have a child enraptures her, steals petals from the lush plant, leading to her impregnation. When the infant arrives, the enchantress (whose desires to have a child are also fervent), steals the child, naming her ‘Rapunzel’. The remainder of the tale continues as we know it: the controlling enchantress absconds Rapunzel to a tower where the frequently used idiom is called out daily, ‘Rapunzel, Rapunzel, let down your hair.’ One day it is a Prince that climbs up her fiery, golden locks, bringing forth a blossoming romance. When the enchantress finds out, Rapunzel flees from the witch while the Prince becomes painfully blinded. Months later, he stumbles back to her (and their new-born twins) after hearing her melodic singing that initially brought them together. Their kiss re-stores his sight, allowing them to live happily ever after with his royal family. Writer Duffy brings back Rapunzel’s devastated parents, including them as well in the couple’s joyful new life. Artistic director Liv Lorent creates a magical world for both children and adults. Her choreography is playful and haunting, and at times sensual. ‘Dr Who’ famed musical director Murray Gold's soulful lullabies along with Bafta award-winning costume designer Michele Clapton's artfully quirky, even revealing, costumes constitute a place where the familiar and unfamiliar blur into one. This theme is further enhanced with the intimate stage set-up where set designer Phill Eddolls and lighting designer Malcom Rippeth use single colours such as twinkling purple lights or the perfunctory shade of red on the tips of the rampion to provide powerful tugs on the senses. While not all scenes may be entirely suitable for children, either way you look at it, people of all ages can find something to enjoy in this traditional fairy tale revamped with lots of sentiment and creative genius. 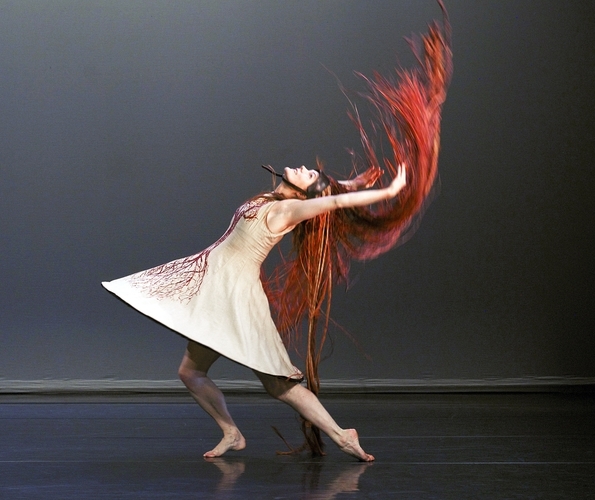 If you missed the show in London, balletLORENT's Rapunzel will be touring nationwide. Next stop is the Oxford Playhouse, Friday 5 April and Saturday 6 April. balletLORENT is also celebrating its 20th anniversary this year, and will bring the production 'The Ball' to London in the summer.